● Add, from your Deck to your hand, 1 monster with 2400 ATK and 1000 DEF with a different name from that Tribute Summoned monster. ● Add, from your Deck to your hand, 1 monster with 2800 ATK and 1000 DEF with a different name from that Tribute Summoned monster. 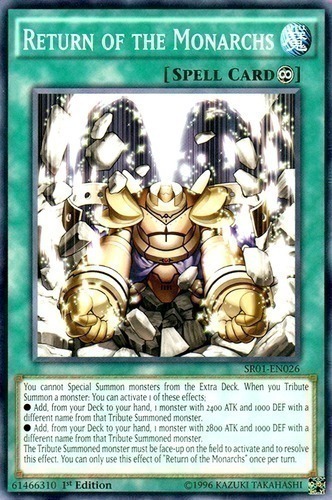 The Tribute Summoned monster must be face-up on the field to activate and to resolve this effect. You can only use this effect of "Return of the Monarchs" once per turn.